Las Cafeteras: this band is SO great. Catch them if you can. do more than just play music. 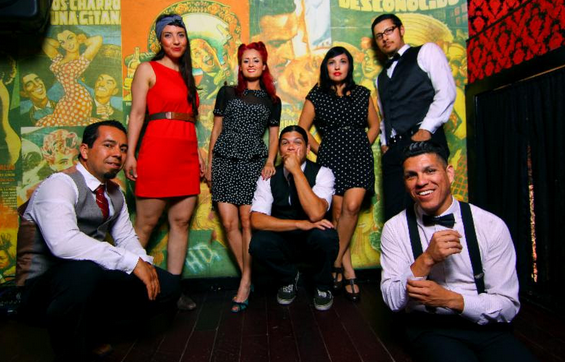 Los Angeles, CA (February 6, 2014) – After a successful 3-month Northwest and Midwest Tour this past fall that had them open for groups like Juanes, Edward Sharpe and the Magnetic Zeros, and the Los Angeles Philharmonic Orchestra, Las Cafeteras hit the road again. This time, Las Cafeteras are going to different parts of the country and will be engaging communities in the East Coast (Boston, New York, Philadelphia), Texas (Austin), Florida (Miami), and Northern California. Along with their performances, Las Cafeteras will also be having cultural exchanges with universities, museums, and immigrant rights organizations with the purpose of sharing stories from their respective cities. *Thanks to Digital Girl PR for the press release! Yes! From the West to the East a little bit of home is coming to me.